A small batch of Toaster Oven Veggie Nachos loaded with shredded cheese, black beans and crispy fresh veggies. Who’s ready to get a little messy? Come along to my favorite happy messy place also known as Toaster Oven Veggie Nachos! It’s a no-forks-allowed crispy chip heaven filled with melty cheese and LOTS of delicious veggies. Part of the reason these nachos make me oh so happy (aside from melty cheese) is because of my big sis. It’s quickly becoming a tradition that we make a double batch when she visits. And the only thing I love more than hanging out with my sister and her family is moving the party to the kitchen and making a fun meal together. A few weeks ago my sister was trying to make these nachos at home and texted me with questions about time, temp, etc but I didn’t see the messages until hours later (Blurg!). Super bummed I immediately wrote Nachos Recipe on my to-do list for the website. I figured this way my favorite hard working mama could always have a place to find the recipe and maybe some of you toaster oven lovers would enjoy it too! So if you’re looking to make a small batch of nachos loaded with all the fixin’s you’ll find our Norris family recipe for Toaster Oven Veggie Nachos at the end of the post. That’s it, you’re all set just grab some napkins and dig in! What’s your must-have nacho topping? Does your family have a special meal or treat for get-togethers? No need to heat up your oven, get your nacho fix using a toaster oven. 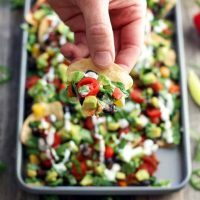 A small batch of crunchy tortilla chips topped with shredded cheese, black beans and lots of crisp fresh veggies. Preheat your toaster oven to 400 F.
Spread the tortilla chips into a single layer on a rimmed cookie sheet (small enough to fit in your toaster oven). Sprinkle chips with 3 tablespoons of the shredded cheese. Top chips with spinach, black beans, chopped bell pepper and jalapeno slices. Sprinkle with remaining cheese. Bake nachos at 400 F for 5 to 8 minutes until the cheese is melted and the toppings are warmed. While nachos bake combine the Greek yogurt and juice from the lime. Mix well, season with salt and pepper to taste. 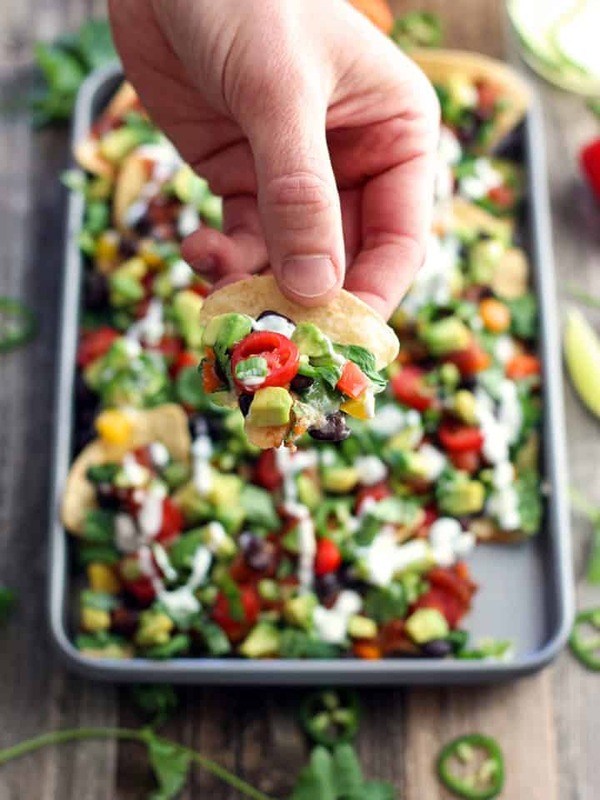 Top baked nachos with salsa, avocado, tomatoes and green onion. Drizzle with lime yogurt and serve immediately. *If your Greek yogurt is super thick you may need to add more lime juice or a teaspoon of water to get a pourable consistency you desire. Recipe makes enough nachos for two people, Nutritional Information is an estimate for 1 of 2 servings. I loved it! It was soooo yummy…. I will do this again! OMG! This is an ultimate party snack! Love all the ingredients and I am going to try it soon. Happy Sunday! Thanks so much Tania I hope you enjoy them! Oooh yes! Great idea Kathryn perfect for Sunday veggie bin clean-outs. Oftentimes, the messier the eating, the more delicious the meal! What a fantastic take on nachos! Gosh I wanna dive right in! Hahaha! I love the notes for your sister! Nachos look awesome!